There’s no better time of the year to indulge in delicious desserts than the holidays. It’s also the best time of year to experiment with things that seem too tough for just a normal dessert. This week, I’ve included recipes for two incredible desserts that seem difficult but are actually truly simple to make if you take your time and enjoy the process. The Orange Cardamom Cream Puffs are light and airy, and the Cranberry Custard Tart is tangy and crunchy and tastes like the season. So enjoy these with our new Diamond Collection cans or perhaps a can of sparkling rosé? 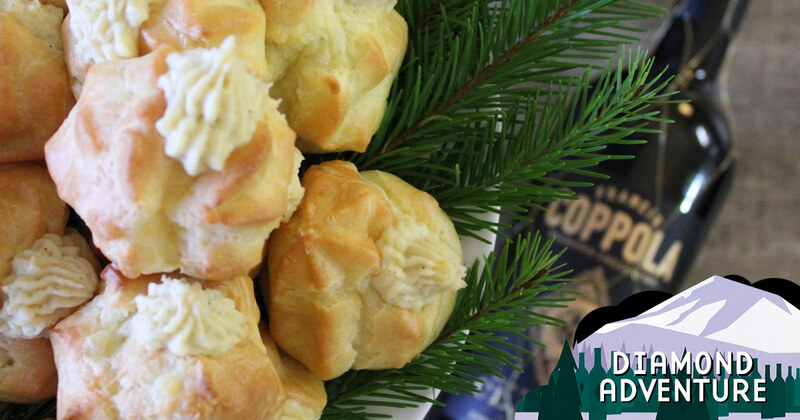 These are traditional cream puffs, a pate au choux base, with a cream filling and an updated flavor profile of cardamom and orange, two of my favorite holiday flavors. In a saucepan, mix your flour, water, sugar and butter together, for about 2 minutes or until the mixture pulls off the side of the pan. Place the mixture in the bowl of a stand mixer and add eggs one at a time. When fully incorporated, place mixture into a pastry bag with a medium tip and pipe 2-inch circles onto lined baking sheet. Bake for 20 minutes or until the puffs are golden brown. In a saucepan, whisk together the egg yolks, cornstarch, sugar and salt. Whisk in the milk and whisk constantly for about 3 minutes or until the cream has the consistency of ranch dressing. Remove from heat and whisk in the cardamom, orange blossom water, vanilla and butter, one cube at a time until completely incorporated. Fill a pastry bag with a star tip with your pastry cream. Filling from the side, push the tip of the pastry bag into the puff and fill until the cream pushes out the side of the puff and leaves a perfect amount of cream on the exterior of the puff. 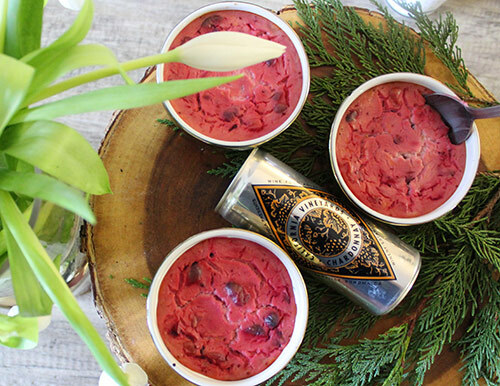 Serve with a glass of our perfect Diamond Collection Claret. In a food processor, combine rolled oats, hazelnuts, brown sugar and butter until crumbly. Press about ½ inch of the mixture into the bottom of each ramekin and bake for 10 minutes. In the meantime, in a saucepan, mix cranberries, sugar, orange and orange zest. Cook on medium heat until the cranberries begin to burst and the liquid turns into a syrup. In a bowl, mix yogurt and eggs until fully incorporated. When the cranberries are all burst and the liquid syrupy, mix into the yogurt mixture. Pour the mixture on top of the crumb crust and bake for about 40 minutes. Enjoy with a can of Diamond Collection Chardonnay. For me, baking is a quiet, enjoyable time to relax. The playlist below reflects that – a soft, wintery mix great for a little me time.